Black and White Fairy-wrens used to be classed as a separate species but now they are simply regarded as island inhabiting variants of the widespread White-winged Fairy-wren. First discovered in 1818 on Dirk Hartog Island by French zoologists Quoy and Gaimard, they were later found further north on Barrow Island as well in 1901. Because Black and White Fairy-wrens are now only regarded as subspecies, few people go to the trouble of traversing Shark Bay across to the island to see them. It is quite a long voyage and even though the birds are easily located in their heathy habitat it is probably worth organising to stay at least one night over there to be sure. If you wanted to stay longer, there is also a resort on Dirk Hartog Island now which is accessible in a 4WD by barge. 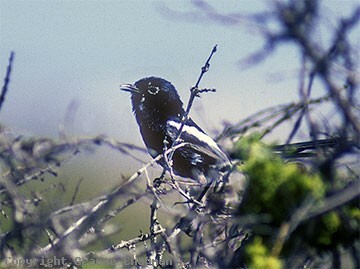 Because they live in relatively inaccessible places, little is known about this black and white subspecies. 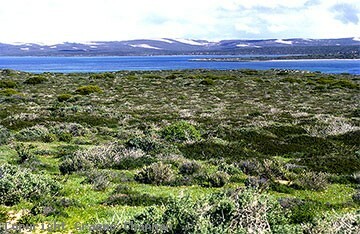 Even though the islands are in a low rainfall zone, the more stable environment of an island climate should allow birds to occupy more permanent territories, possibly in smaller groups with only one breeding male, and not have the need to wander more widely in search of food in winter as is the case in many areas on the mainland. 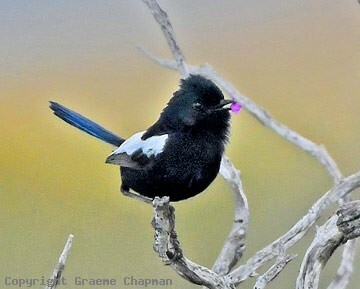 Occasional sightings of what people judge to be Black and White Fairy-wrens are made on the mainland in the vicinity of Denham but no specimens have ever been collected. It should be noted that the blue colour in fairy-wrens' feathers is structural and can vary with the angle of the light, not because of a blue pigment. If you hit one of these feathers with a hammer, the "colour" disappears! 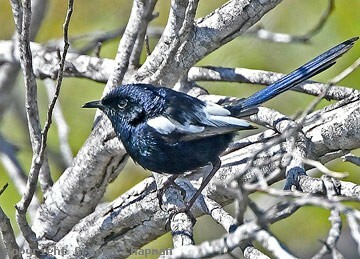 533201 ... Black and White Fairy-wren, male, Dirk Hartog Island, W.A. 533202 ... Prime habitat, low, open shrubland on Dirk Hartog Island. 533203-D ... Black and White Fairy-wren male carrying pink petal for display. 533204-D ... Black and White Fairy-wren, adult male, Dirk Hartog Island, Sept 2016.